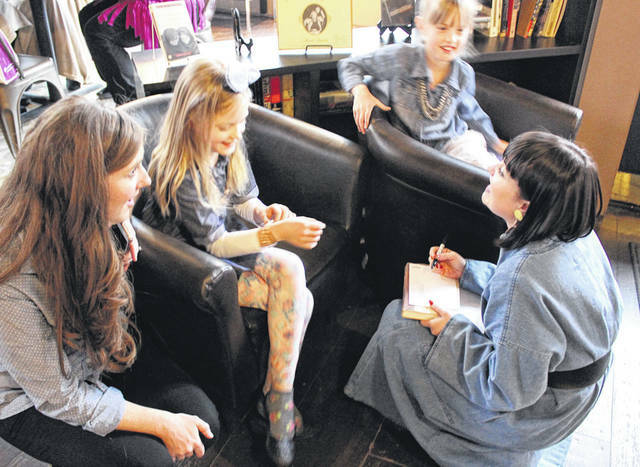 Project Runway contestant Tessa Clark signs autographs for Libby and Laney Mott of Greenville (with mother Lauren Mott). Clark met friends and admirers at The Coffee Pot in Greenville for a watch party Thursday evening. 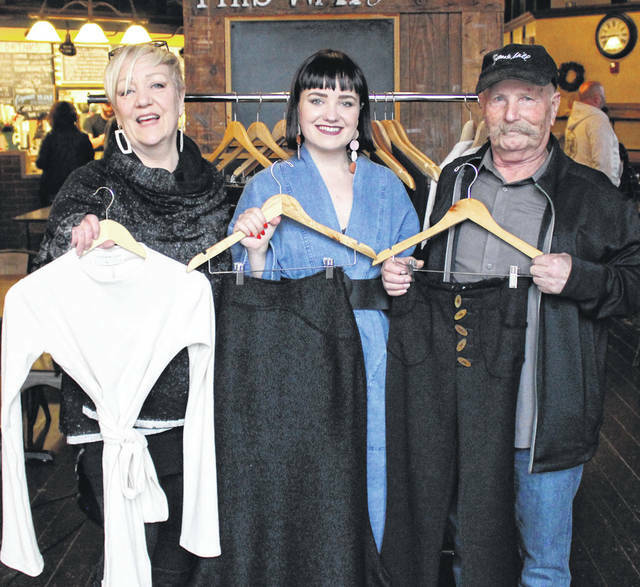 Project Runway contestant Tessa Clark (center) displays some of her fashions, helped by parents Terry and Julie Clark. Clark visited The Coffee Pot in Greenville for a watch party Thursday evening. GREENVILLE — Dozens of area residents gathered Thursday evening in downtown Greenville to celebrate the success of a local woman rapidly making a name for herself nationwide. Fashion designer Tessa Clark of Cincinnati, formerly of Greenville, and currently a contestant on Bravo’s “Project Runway,” was on hand at a watch party, spending time with family, friends and admirers as they viewed the second episode of the show. The event, held at The Coffee Pot, was organized by the Darke County Visitors Bureau and Greenville National Bank. Visitors Bureau Director Matt Staugler said Clark’s success has put Darke County in the spotlight. GNB Marketing and Development Officer Lisa Martin agreed. Clark was the winner of the first episode of Project Runway, and gained immunity for the second episode, which was aired on a large-screen TV at the gathering. During the second episode, Clark participated in a team challenge, and led her group to a team victory. Terry Clark, Tessa’s father, said she has always been an incredibly hard worker. “She’s always gotten up early, worked hard, and I think it’s all paying off now,” he said. “She’d get up at four in the morning, grind grain, make pancakes, and she could go in and make the pottery that we could eat the pancakes on. “She can operate a backhoe and she’s not married. I don’t understand it,” he added. “I’m nervous to see how it’s all going to play out,” she said. While she cannot reveal too much information on upcoming episodes, even to her family, Clark said the Project Runway experience has been life changing. “I love this. I love having the prompt of a challenge,” she said, adding that her time at the University of Cincinnati’s design school helped prepare her for intense work situations. Despite being in competition, Clark said she cherishes the camaraderie she has built with the other designers. To young people interested in pursuing a career in fashion design, Clark advised going after what they really want to do. The next episode of “Project Runway” airs Thursday, Mar. 28, at 8 p.m. on Bravo. This entry was tagged Bravo, Coffee Pot, Darke County, Greenville, Project Runway, Tessa Clark, watch party. Bookmark the permalink.